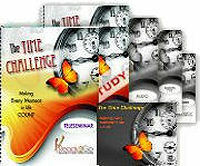 Teleseminar & Self-Study Coaching Program: The Time Challenge - Making Every Moment in Life Count! from Ready2Go Marketing Solutions, Inc.
You would think that by the time we reach adulthood, we would recognize time as one of our most precious and limited of gifts. Between career demands, family needs, and a slew of responsibilities in between, we are all probably wishing there would be more hours in the day so that we can spend some time doing the things we really want to do. Last anyone checked there still was only 24 hours afforded to us each day. Perhaps a better question we should be asking ourselves is why 24 hours isn’t enough? Just exactly what is taking up all our time and why aren’t we able to make time for the things that matter most? 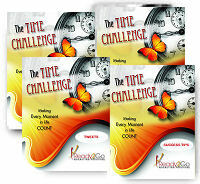 From this teleseminar you will be able to effectively manage your time by. . .
Activity Objective: Participants prioritize which information is most important to share. Activity Objective: Participants assess what times during a 24 hour day they are at their most energetic in order to accomplish important tasks. Activity Objective: Participants learn about and discuss what it means to be an effective time manager. Activity Objective: Participants identify tasks they have to do and assign a priority ranking to them. Activity Objective: Participants learn strategies for optimizing their time with a time prioritization grid. Activity Objective: Participants recognize the power of single-tasking and the ramifications of multi-tasking. Activity Objective: Participants identify the major time distractors in their lives and prioritize the top five that impact them the most. Activity Objective: Participants are made aware of the value of time and time management by comparing it to how they spend another limited resource– money.